The Pedestal Bulletin Board stands on its own two legs!This is why we constructed the Pedestal Bulletin board with two legs that support the sturdy board from each side. The tempered glass safety door ensures any notice or announcement that you display remains intact. Our unique tumbler lock only opens with a key that you should give to entrusted members of your staff. Heavy-duty satin-anodized aluminum provides frame support, further strengthening one of the most durable bulletin boards on the market. 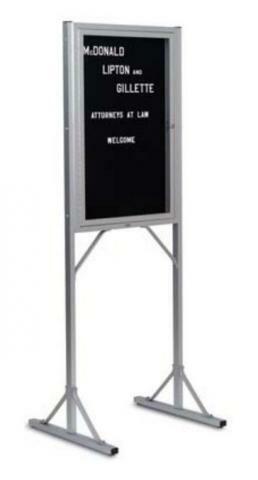 The Pedestal Bulletin board is available in two sizes to meet your meeting, seminar, and special event needs. You can even place the bulletin board outside in front of the main entrance and not have to worry about weather elements damaging its surface.